300 beta testers will be getting a Machine. Valve's Steam Machines are on their way, but beta testing comes first. Only 300 prototypes are being shipped out, but each and every one of those prototypes will come with Metro: Last Light bundled in. Developer 4A Games is very excited to be bringing its post-apocalypse survival title to Steam's OS. 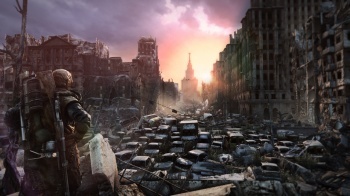 "Metro: Last Light will be a great showcase for SteamOS and the Steam Controller," says 4A's Oles Shishkovstov. The prototype Machines will be going to Valve's pool of potential tester candidates. Of that group, 30 have been chosen based on past contributions and their current beta participation. The rest are chosen at random from the pool, and all will get their Machines free of charge. Valve's planning on getting a variety of Machines to market in mid-2014, each variant intended to satisfy a different consumer base. "It isn't until this coming year when there are going to be enough of those pieces that all work together that we can say in a credible way to all of our customers," said Valve's Greg Coomer when the 2014 announcement was made, "Hey, if you're one of the people who likes to play games in the living room - and we know there are a lot of you - now we have enough dots connected that we think you should try this.'"